The Era of Trump has been a blessing for America’s news media, giving them a never-ending stream of stories that have captivated the public. Just over two years into Donald Trump’s presidency, it seems the media and the public have yet to get bored with him. 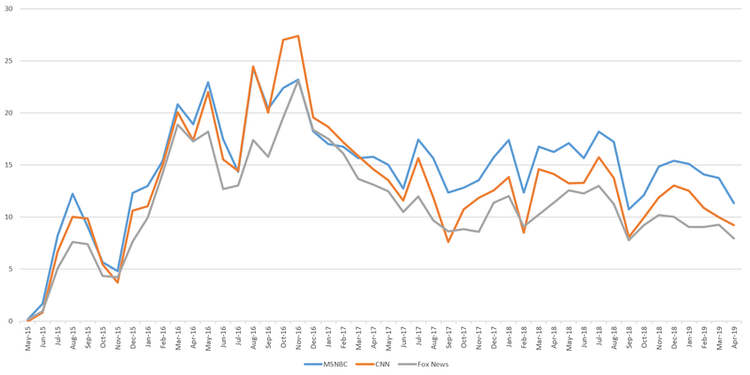 The timeline below shows the total percentage of airtime of CNN, MSNBC and Fox News mentioning Trump by month since May 2015, using data from the Internet Archive’s Television News Archive. Coverage of the then-candidate increased steeply from his June 2015 announcement through his November 2016 election, then decreased through June 2017 before essentially stabilizing through the present. During his candidacy, all three channels covered him fairly closely, though Fox News has always mentioned the president less often than the other two. In May 2017, MSNBC took the lead in covering Trump, followed by CNN and then Fox News, with this lineup remaining remarkably consistent ever since. In total, since May 2015, MSNBC has devoted 7.5 percent of its airtime to mentions of the president, followed by 6.2 percent for CNN and 5.1 percent for Fox News. Sharp-eyed readers will notice that mentions of the president do appear to be decreasing slowly, especially over the past year. However, it turns out that this decrease is not due to diminished interest in Trump, but rather a shift toward coverage of the issues that involve him, especially the Mueller investigation. The timeline below shows the combined airtime across MSNBC, CNN and Fox News that mentioned Trump versus the airtime that mentioned Trump plus Mueller. Immediately clear is that mentions of the president alone have decreased in the Era of Mueller, replaced by discussion of the investigation that centers on him. Overall, however, there has been little change in interest in the president, with around 15 percent of all television airtime across the three news channels mentioning Trump or the Mueller investigation involving him over the last two years. 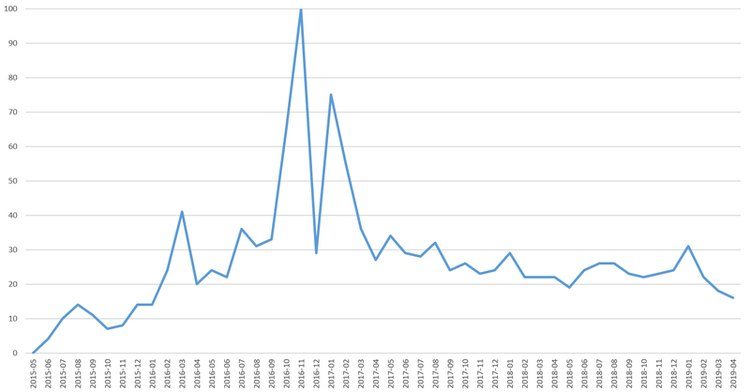 Media interest doesn’t always align with the public’s interest, but in the case of President Trump, it appears the latter has similarly remained constant since early 2017. The timeline below shows overall U.S. search interest in the president, using data from Google Trends. Google does not report the raw number of searches, instead reporting the month with the greatest number of searches as 100 percent and reporting the remaining months in relation to it. Putting this all together, Donald Trump has demonstrated remarkable staying power, with either he or the major issues involving him garnering consistently level coverage for most of the two years of his presidency. The public seems to be similarly captivated, with search interest exhibiting a nearly identical steady stream. While he has polarized the nation with his policies, it seems Trump has united it in interest in himself. RealClear Media Fellow Kalev Leetaru is a senior fellow at the George Washington University Center for Cyber & Homeland Security. His past roles include fellow in residence at Georgetown University’s Edmund A. Walsh School of Foreign Service and member of the World Economic Forum’s Global Agenda Council on the Future of Government.